It’s been a while between Meatless Mondays I know but I’m back with something that’s super simple but extra special! Actually, this tart was a happy accident. It was after Christmas; we were full of food and the fridge was almost empty, except for some cheese, some homemade pesto and a jar full of olives. I always have a stash of puff pastry in the freezer and so this tart became deliciously inevitable. Over the last month or so, we’ve made this multiple times because it’s so quick, so easy and uses just a handful of ingredients. 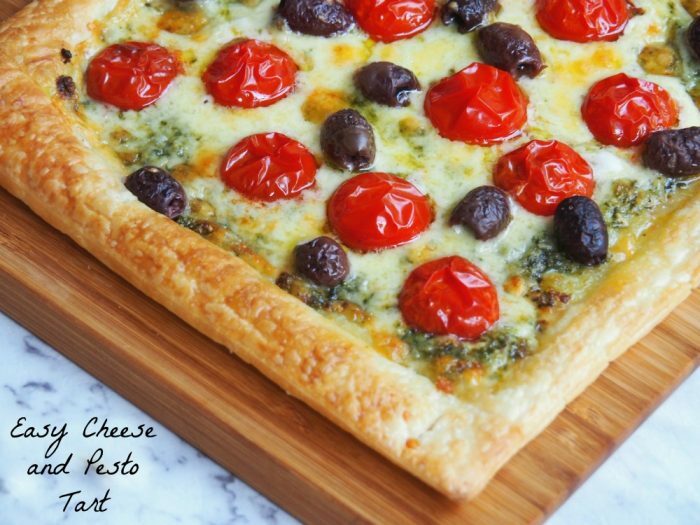 Talking of ingredients, the list is super flexible, add in or take away things you like or things you don’t, you can’t go wrong with the pastry, pesto and melted cheese trifecta. 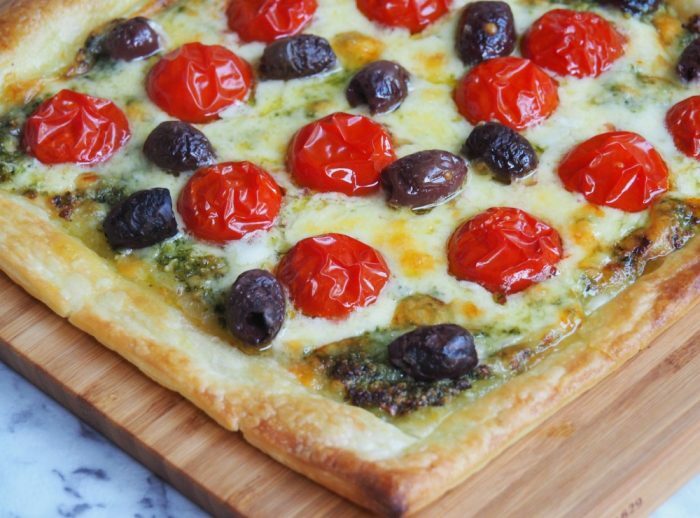 Although this is a Meatless Monday recipe, it’s worth remembering that pesto is made with parmesan which is not a vegetarian cheese, so if you’re using a shop bought pesto, check the ingredients list, and if you’re making your own, swap out the parmesan and use some nutritional yeast flakes instead. My friend Belinda has been in hospital for most of this month and I work on the theory that she needs to be well fed to get well. I’ve taken in a succession of dishes, with everything from chicken soup to homemade pizza, but Belinda declared this the best of the bunch… Even with the crumbs in the bed! I think Belinda is right, you’ll heart this tart! Do you have a secret stash of something in your fridge or freezer? Are you a pesto lover too? Heat oven to 200C/180C fan-forced. Line a baking sheet with baking paper. Place defrosted pastry sheet on baking tray. With a sharp knife, score a 3cm wide border around the edges of the pastry. Fork the pastry all over the centre of the pastry inside the border. 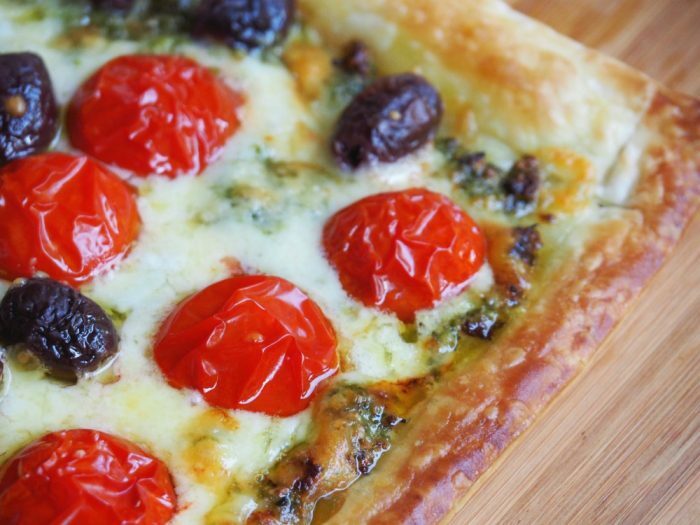 Spread the pesto over the centre of the tart, taking the pesto right up to the border. 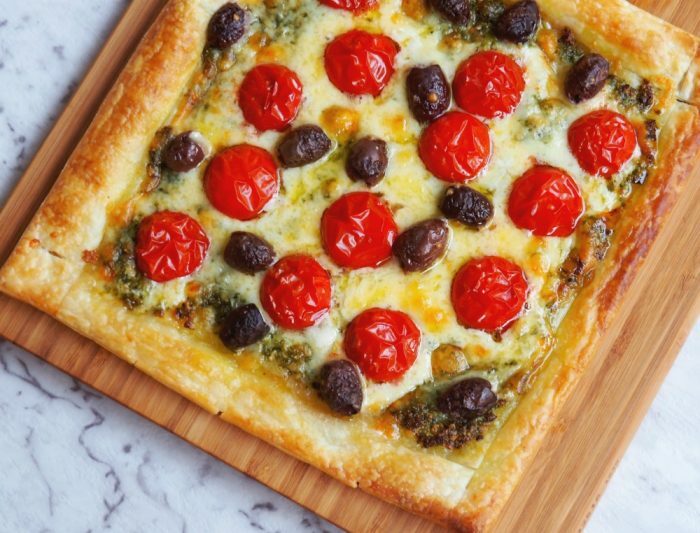 Top with tomatoes (cut side down,) olives and top with the grated cheese. Scatter the pine nuts over the top and season to taste. Bake for about 15-20 minutes until the tomatoes are soft and the cheese is golden.